HTC has introduced its brand new smartphone focusing more on entertainment called "HTC Sensation 4G" also known as "HTC Sense" HTC calling it a "multimedia superphone". 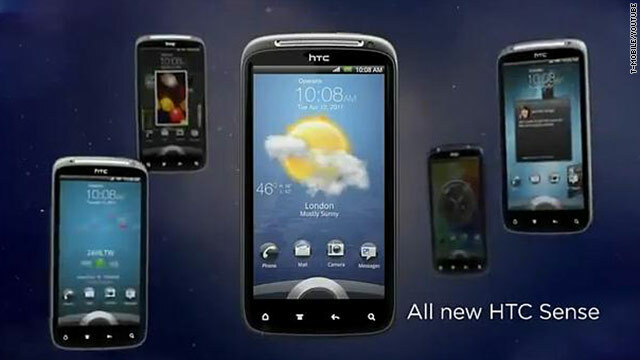 HTC Sense 4G having Google's Android operating system and will be exclusively available on T-Mobile in the United States. It will be released sometime this summer, according to the press release from HTC. The HTC Sensation 4G includes the HTC Watch video feature, an app that provides access to a library of recent movies and television shows. The app's technology lets users begin watching a video without having to wait for the entire file to download, according to HTC. This video feature also lets users buy or rent videos and play them across multiple HTC devices. The HTC Sensation which had been widely referred to as the HTC Pyramid while it was in development also features HTC's Sense system which, among other things, lets users program their "lock" screen to show social media updates, photos, weather and other media. "Consumers have quickly transformed smartphones into consumer lifestyle hubs that are pocket-sized entertainment centers that enable people to take their favorite multimedia content with them wherever they go"
HTC Sense System is already available on the HTC Legend and HTC Inspire phones, but the version on the Sensation is updated with new features. HTC Sensation 4G has a 4.3-inch widescreen display, an 8-megapixel camera and a dual-core processor. Prices have not been announced yet. HTC Sensation 4G have got the positive review from most website critics like PC World which got a hands-on demo, called it a "beautiful, dual-core beast" and CNET's Bonnie Cha writes that, by the end of a demo, she was "trying to think of ways to distract HTC so I could run off with the smartphone."